The recorder is the one instrument that all members of Courtly Noyse play - we own and use eight different sizes, and there are actually even more. Although we own approximately 40 individual recorders between us, Henry VIII of England has us beat - he apparently had 76 in matched sets. Many Renaissance instruments come in families like this, suitable for playing multipart music with a homogeneous sound. The recorder is basically a simple wooden pipe with holes, but the larger ones have one or two keys and a tubular metal mouthpiece (bocal) for ease in playing. The recorder fell into disuse by the eighteenth century, but was revived in the twentieth, since when it has become a popular music teaching tool for school children. "Krummhorn" is a German word meaning "curved horn". The hook at the bottom directs the sound toward the front. The strange nasal sound is produced by a capped reed i.e. a reed concealed inside the instrument which does not come into direct contact with the lips. As a result, pitch, timbre and volume are all very difficult to control - you’ll notice that we need to tune them every time before we start to play. Laury built the entire consort that we use. The cornamuse resembles the krummhorn in that it is also a capped reed, but it has a straight bore, no bell or opening at the bottom, and a softer sound, as well as requiring less breath pressure to play. Sandi plays the bass viola da gamba, the largest member of the viol family in common consort use. Although superficially resembling a cello, it has six or seven strings, no end pin, and frets, making it much more similar to a giant bowed guitar. The strings are made of gut (sheep’s intestines), and these contribute to the viol’s quieter, reedier sound. It died out because it could not compete in carrying power with the members of the violin family. 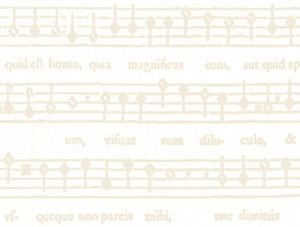 The lute, quiet though it is, dominated the instrumental music of the Renaissance. It was the main harmony instrument used for accompanying singers, and also has a vast body of solo literature. Its light and fragile pear-shaped body strung with twelve or more gut strings makes it very temperamental and often difficult to tune. The lute began to decline in importance by the end of the seventeenth century, although it is interesting to note that the position of court lutenist in England was not abolished until the reign of Queen Victoria. The gemshorn, a predecessor of the recorder, was originally constructed from the horn of the gems or chamois, an Alpine goat. Its range is significantly smaller than the recorder, and its sound less focused. There have been instruments made from or shaped like animal horns throughout history, but the gemshorn is different in that the mouthpiece is at the wide end. We don’t know what animal donated its horns for our use, but the chamois is now a protected species. The cornetto is a curious hybrid, with features of both woodwind and brass instruments. Built of wood and covered in leather, it has a cup-shaped mouthpiece like a trumpet and holes like a recorder. Much admired as the instrument supposedly most resembling the human voice, it is nevertheless very difficult to play, which undoubtedly contributed to its decline. The vielle is a predecessor of the classical violin and the fiddle of folk music. It was used in the 13th through 15th centuries. Its shape is somewhat different from a violin, with a completely flat body as opposed to the slightly convex surfaces of the modern instrument. Although Sandi holds it "violin-style", some performers play by holding it against their upper arm. The rackett may look like a pepper grinder, but it’s the ancestor of the modern bassoon. We play both a renaissance rackett which is fairly quiet (see image at left), and also a larger, louder baroque rackett. These were followed by the dulcian, sordune, and several variants of the modern concert bassoon, each growing longer. They all have double reeds. The hurdy gurdy is thought to have been developed from fiddles in the 10th century or even earlier, making it one of Courtly Noyse's earliest instruments along with the vielle, drums and other percussion. It consists of crank which turns a wheel, which rubs several strings. Some of the strings are drones (play a constant pitch) and some can be stopped with tangents at various points to produce various notes. Various older versions were called the organistrum and the symphonia. One can be seen in a 12th-century carving on a cathedral in Galicia, Spain. The shawm is a double-reed instrument which appeared in Europe in about the 12th century. Because of its conical bore and flared bell, it can be quite loud. It's name came from the words s(c)halmys (middle English), sc(h)almuse (old French), and chalemel from the Latin calamus for "reed". It eventually developed into the modern oboe which, unlike other most modern instruments, is actually quieter than its predecessor. A similarly-named instrument, the chalumeau, developed into the modern clarinet. The sacbut was an improvement on the slide trumpet, developed in the 15th century. It was admired as one of the few instruments with a wide dynamic range and the ability to produce a variety of timbres. It evolved into the modern trombone. Slides were the main method of changing notes in brass instruments until the invention of valves in the 19th century.